UC San Diego bounced back from a recent loss and won two consecutive games in California Collegiate Athletic Association conference play. The first match, versus Cal State San Marcos, ended with a 73–65 UCSD victory. The second game was a nail-biter — UCSD won by just three points, 67–64. With this pair of wins, the Tritons improve to 11–3 overall and regain second place in the standings behind the 13–2 Cal Poly Pomona Broncos. The Tritons came out of the gates sprinting against the Cougars, quickly securing a 7–0 lead in the first two minutes of play. UCSD dominated the first half, growing its lead to 15 at one point in the half off of sophomore forward Scott Everman’s layup. The closest Cal State San Marcos came to closing the gap was at the 1:06 mark in the first half. A quick jumper by a Cougar player cut the Triton’s lead down to nine, 34–25. A layup by senior forward Kenny Fraser helped UCSD maintain its lead, now 36–25, going into the half. In the second half, Cal State San Marcos rallied and made a push for the game. The Cougars started playing aggressively and the Tritons tried to respond. 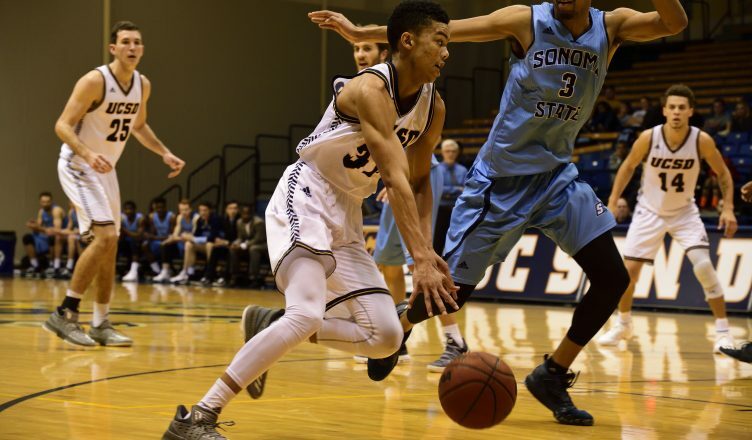 The increased aggression from Cal State San Marcos led to foul calls against UCSD. This slowed the clock down, allowing the Cougars to close the gap to four points, 54–50. With 6:50 left to play, this was the closest the Cougars would get to coming back, as the Tritons would turn up their defense and lock down the Cougars. Everman was UCSD’s leading scorer for the game, pairing 24 points with seven rebounds and two assists. Junior guard/forward Christian Oshita finished with 12 points, eight rebounds, and four assists. The third Triton to finish with double-figure points, junior guard Christian Bayne scored 11 points with 4 rebounds and 4 assists. UCSD opened the contest up with a three-point shot by senior guard Anthony Ballestero. After a pair of missed shots by the Seawolves, a jumper by Oshita put the Tritons up, 5–0. The Tritons held the lead (30–24) going into halftime, but not without difficulty — almost losing it to three unanswered, consecutive three-pointers by the Seawolves. The Tritons faced some heavy pushes in the second half. Quickly pushing their lead to 11 points (35–24), the Tritons initially looked solid. However, Sonoma State was still fighting, making repeated pushes to gain the lead. However, the team managed to outrun the Seawolves charge, finishing the game up three (67–64).